Most restorers have worked out their own ways to tag and flag the parts they remove while fixing a vintage vehicle. 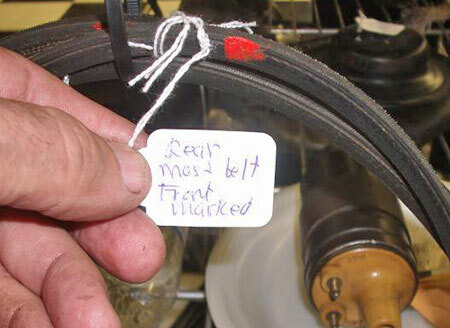 Some write notes on masking tape and stick it to the parts, some throw related groups of parts in labeled plastic bags and some rely on digital photos to aid in re-assembly. One professional we know tries to layout parts exactly as they appear in exploded views in shop manuals, while a particularly well-organized hobbyist numbers each part, puts it in a cabinet with corresponding numbers and logs it into a computerized list. That last system works well for this particular hobbyist because he views restoration as a leisure activity and never rushes to get a project done so he can drive the car. In fact, he is only interested in restoring the car and selling it, rather than driving it or taking it to a show. So, while his parts tracking system is darn near perfect, it's a little too time consuming for those of us in the "real world" who want to restore a car so we can satisfy an anxious customer, use it for hobby events or sell it and make a buck. We want a nice restoration to get done ASAP. Certain techniques of tagging and flagging parts work well in the real world and others don't. At a recent club activity, a car owned by a member from a distant state broke down and his fellow members tried to do a quick engine teardown, hoping to fix things so he could get home. They worked very quickly and used masking tape to label the parts they removed. Notes were scribbled on the tape with a ballpoint pen. After just a few weeks, the notes could not be read. A much better way to organize a speedy teardown involves the use of scrap pieces of cardboard and Sharpie® type black markers to store and label bolts, nuts, brackets and other small parts. 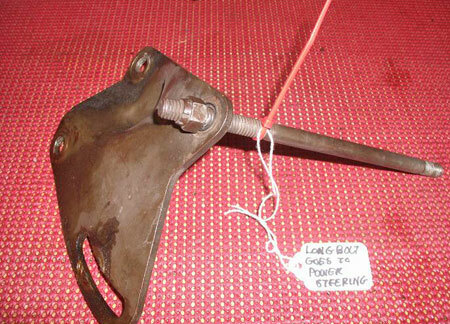 A single piece of cardboard cut from an old shipping box can be used to hold several related parts, such as the bolts removed from an exhaust manifold. 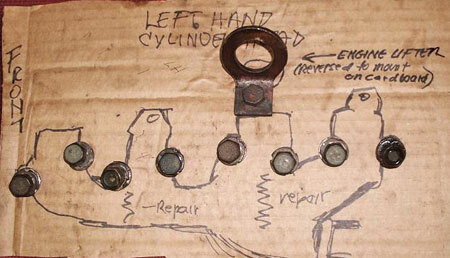 Draw a rough picture of the exhaust manifold on the cardboard and draw circles or hexes where each bolt goes. Next, poke a scissors through the drawing wherever you drew in your bolt symbol. Then, push the actual bolt (along with washers that are on it) through the holes you made. In addition to bolts, flat washers and star washers, brackets like this generator mount can be fastened to cardboard panels using spare nuts. Cardboard panel holds right-hand cylinder head bolts, plus bolt that attaches ATF tube to back of head, with all items labeled for proper positioning. If the bolts fit tightly in the holes you made, just force them into the holes and leave them be. If they fit quite loosely and are likely to fall out, you can secure them in place by running spare nuts with the same thread pattern up the shafts of the bolts on the reverse side of the cardboard. Make a note to tell yourself the nut is extra. 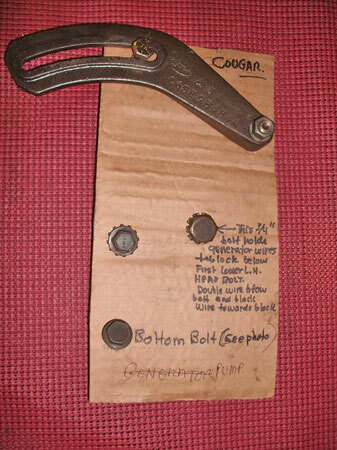 You can also attach nuts and bolts to your cardboard panels using garbage bag twist wires or "belt buckle" type electrical ties. Use your marker to write or sketch re-install instructions right on the cardboard panel. Naturally, the holes for the bolts in the cardboard should be arranged to approximate how each bolt is positioned on the vehicle. That way, if an exhaust manifold is held on by both long and short bolts, the layout on the cardboard will tell you what length bolt to use in each hole. By the same token, bolts with different widths, different threads, different shapes or different designs can be arranged in a way that helps you know how to put them back where they were. Rough sketch of exhaust manifold is good enough to document bolt positioning. We also noted repairs and that the engine lifting eye is flipped over. Marking the exhaust bolt positions becomes important when different length bolts are used in different mounting holes as in this case. In addition to bolts, cardboard panels can be use to hold brackets, engine lifting "eyes," valves, push rods, pulleys, spark plug wire looms, vacuum lines, fluid tubes, etc. 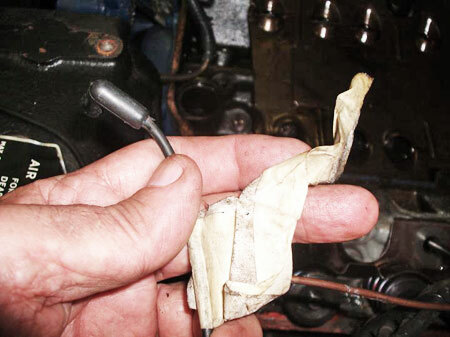 You can even bolt a carburetor to a cardboard "base" and add notes about how to position the carb and where to attach parts and connections. It is simple, but important to have enough different sized pieces of cardboard around when you start a restoration. Some related groups of parts will fit very nicely on a small cardboard panel, but other parts may require a large panel. Holes can easily be poked in the cardboard with a screwdriver or pair of sharp scissors, but don't poke your hand. In some cases, the shape of a certain part may make it easier to attach to a cardboard panel when it is flipped over to a flat side. If you do this, be careful to note the "flip" on the cardboard or you may wind up installing the part backwards on the car. In addition to lots of cardboard, it's good practice to have a new set of markers available at the start of the project. You may even want to use different color markers to color code notes. Another way to tag and flag "matching" bolts and bolt holes is to wrap short, colored electrical ties around them. A yellow tie can be snugged-up around a bolt and a second yellow tie can be wrapped through the hole that the same bolt goes through. 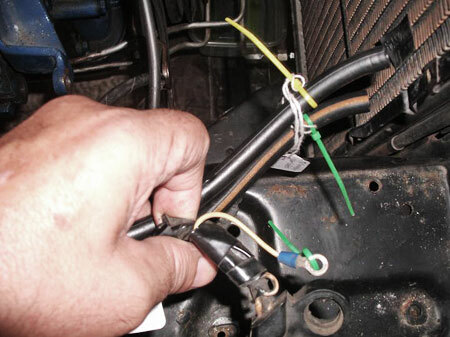 You can also color code spark plug wires with electrical ties. 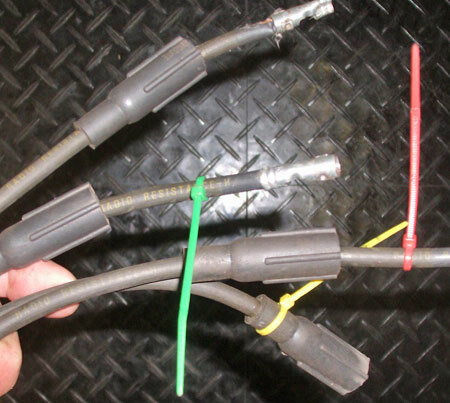 When working on a V-8, one mechanic we know uses red on the first plug wire, yellow on the second and green on the third. The fourth wire has no electrical tie. Electrical ties can be used to color code parts in one group that fit together. The string tag tells what this group of parts is and/or where it goes. In this case the red electrical tie is simply being used to hold the bolt in the proper hole in the power steering bracket. The string label tells what parts are. Electrical ties can also be used to color code spark plug wires from front to rear so you know which plugs to put them on. Use your own color sequence. As stated previously, notes written on masking tape seem to have a very short lifespan. For some reason, masking tape seems to attract grease and oil and shed ink rather rapidly. Deciphering a note on old masking tape is like trying to read a phone number that you wrote on a matchbook cover and stuck in your pocket months ago. String tags are a better alternative. They are cheap and they're made for writing on. If you want the writing on a string tag to really last, stick some clear plastic tape over it, but don't ever write notes over the tape! What happened to the magic marker notes written on this piece of masking tape that's only a few weeks old? Another great way to store nuts and bolts is in a cupcake tin. You can buy old used ones very cheaply at a Goodwill store or Salvation Army store. Put one group of fasteners into one "cup" and put a separate group into another "cup." You can write dimensions and thread styles right on the cupcake tin with a marker. Then, you sand off the writing later, after the restoration work is finished. If you're taking a set of digital photos in order to carefully record the restoration, be sure to keep track of the numbers of the important photos — say pictures of how an idler pulley was bolted to the motor. 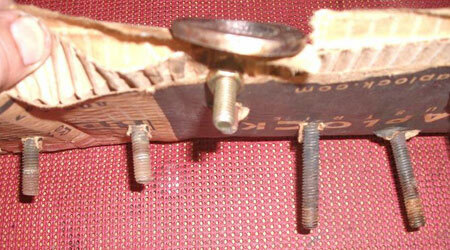 Then, when you bolt the pulley to a piece of cardboard, use a marker to put a note right on the cardboard. That says "Refer to images IMG_4567 to IMG_4575. 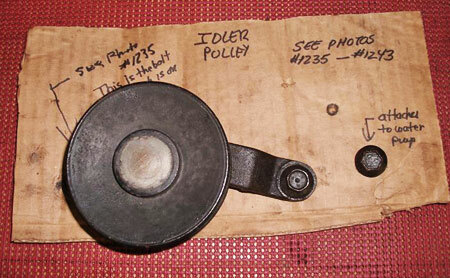 You can dig out that photo sequence to see how the idler pulley was attached to and removed from the car. Notes for positioning and re-mounting this pulley refer to a sequence of digital photos taken during dis-assembly to help visualize proper re-assembly. This string tag is used to mark the rearmost drive belt and just to be sure the belt goes back on exactly like it was, we dabbed red paint on the front. Cardboard panels, plastic belt buckle type electrical ties and string tags provide simple, easy-to-use tools for tagging and flagging parts when restoring a vehicle. Since memory is a fleeting thing, try to label each part as soon as you remove it from your car or truck. If you wait until you remove the next couple of parts, you may forget exactly how they were positioned or attached. 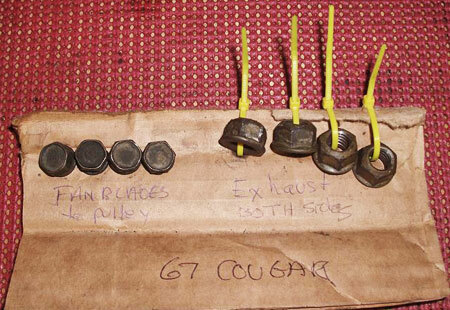 Electrical ties can also be used to attach parts (such as these exhaust pipe flange nuts) to cardboard panels. Carefully tagging and flagging each part takes extra time and will slow down dis-assembly work. That's why many professional mechanics don't do it. They usually have their own ways of placing parts on a bench for re-assembly. However, professionals are used to putting a vehicle back together with readily available new parts in a short time span. When doing collector vehicles, it often takes much longer to find parts and we have seen professionals run into problems because they did not tag, flag and photograph the parts they removed months or years ago. If you go slow during disassembly and keep things organized and recorded, putting the vehicle back together again will go faster. 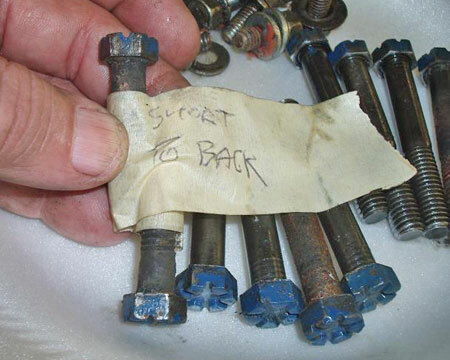 Bolts were labeled by hobbyists who began project before it came to us. They know what "short to back" means, but we don't know where these bolts go. Tags like this should be more informative in case others finish what you start.